Australian patent No.2011283734 and International Patent pending PCT/JP2011/66957 in Japan. new way of installation. Use for ukulele, acoustic bass, contrabass, djembe, cajon, conga drum and so on. MSP stands for Magnet Sandwiched Pickup. It is made with Neodymium magnets and a piezoelectric element. The installation of the MSP is innovative. A positioning magnet and an additional magnet in the MSP device hold the MSP's piezoelectric element in place. MSP is capable to capture details of acoustic instruments. Two Neodymium magnets, one within the MSP and an additional Positioning Magnet, push the piezoelectric element toward the soundboard. 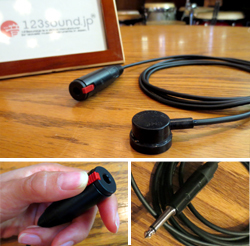 This provides louder and higher quality sound without the use of a pre-amp. You can use more than two MSPs on an instrument for each playing style. There is no modification needed and no damage caused to musical instruments. The installation is very easy. Because MSP is kept in place by magnets, musical instruments are not damaged or dirtied due to adhesives or the like. The MSP is placed outside of musical instruments, so it can be installed without any through hole. Because there is no wiring inside of instruments using MSP, there is no unwanted sound caused by problems with such wiring. MSP does not fail. It is an easily removable contact pickup. The sound emitted from the contact pickups depends on the attachment position. The free movement of the positioning location allows the player to control sound output based on their preference. - The content of this kit is unique to this website. - Cable length and the connection type of MSP as well as attachments depend on each kit if you purchase from other suppliers. Sandwich the soundboard of your instrument between the MSP and Positioning Magnet. Make sure to read the Installation and User's Manual and see the following videos. 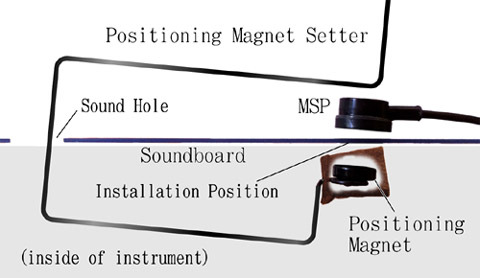 The MSP is placed outside of the musical instrument and the Positioning Magnet is placed inside of the musical instrument. Make sure to read Installation and user's manual and the following videos. The Positioning Magnet and the MSP are both used to install the MSP. You can attach the MSP to the soundboard more strongly by piling Positioning Magnets. Changing the pushing force of the MSP towards the soundboard allows the quality/tone of the sound output from the MSP to be controlled. When your hand can't reach the desired position for the Positioning Magnet, use the Positioning Magnet Setter. These are some examples: ukulele, woodbass, etc. To fix the Positioning Magnet location use double-adhesive tape. This way you can place the MSP without setting the Positioning Magnet each time. To install the MSP after fixing the Positioning Magnet in place, slide the MSP into position from the side slowly. Don't apply the MSP directly. When using double-adhesive tape to fix the Positioning Magnet, it will not be possible to fine tune the sound produced by the MSP pickup and removing the magnet may prove difficult. 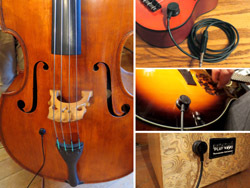 Hang the Endpin-hanger on the end-pin of instruments like guitars to keep the the MSP cable at a useful length. Peel off the sticker. The transparent side is the sticker. The lattice patterned side is the sticker's protective layer. Put the sticker on the instrument surface where the MSP is positioned. The sticker uses static electricity instead of adhesion. Adjusting the pushing force of the MSP towards the soundboard allows for sound quality and tone being output by the MSP to be controlled. When you alter the thickness and number of Positioning Magnets, the pushing force is changed. You can also stop the MSP from floating on the surface of percussion instruments like the conga by using additional Positioning Magnets. Placing Cushioning (rubber or a sheet of felt) between the MSP and the soundboard allows for sound quality and tone being output by the MSP to controlled. You can also stop the MSP from floating on the surface of percussion instruments like the conga by using Cushioning. 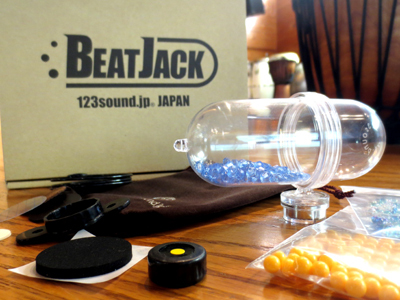 BeatJack is an new type of shakers that is used on an instrument you have already had. It is in patent pending and design registered. It can add rhythm on sound of your stringed instrument or supply many sound variation to your percussion. BeatJack is installed by applying magnets to both sides of the soundboard. It not only creates an amazing performance and sound that we have never heard before, but its amplified sound also reverberates inside the body of your instrument and is emitted through the sound hole output. 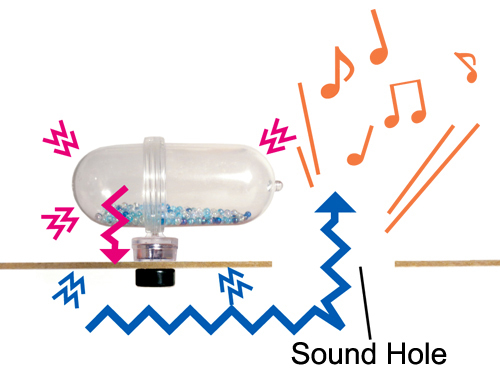 In addition, the sound-balls dancing in your BeatJack is for all to see with its see-through body. BeatJack will attract your audience at every performance because of its practicality and visual effect. Taxes are not included in the item price. Female (Jack) 1/4" Male (Plug) 1/4"
Our products might be refused to be carried by airmail, as the terms of transport by airplanes have become stricter. We deal with our products via EMS. However, if packages are refused to be carried by airmail, we will contact you. Please make sure that your order will be canceled or reshipped by sea mail in this case. Please make sure "Installation and User's Manual""Return Policy" and "Product" on this page before purchasing the item. -We are usually closed on Saturday and Sunday. Copyright© 2013-2018 123sound.jp All Rights Reserved.